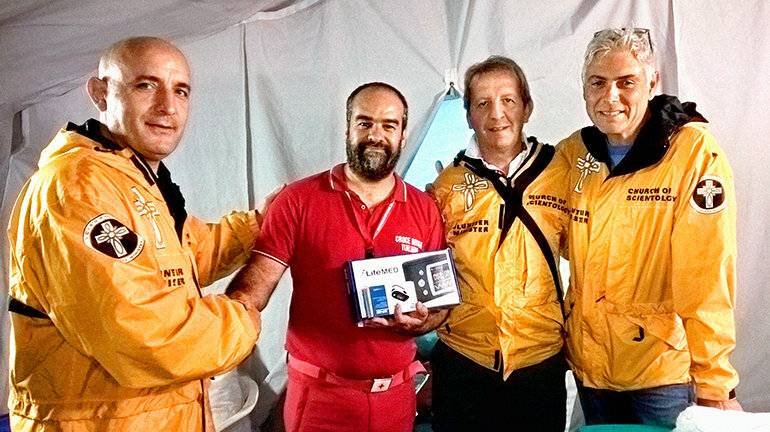 Italian Volunteer Ministers provide medical supplies to the Red Cross In-Charge to assist earthquake victims in Central Italy. In keeping with tradition, Volunteer Ministers bolted to the front lines to lend a hand to those suffering in Italy. It was déjà vu for the Italian Volunteer Ministers who sprang into action in the wake of the August 24 deadly 6.2-magnitude earthquake that killed some 290 and has caused an estimated $11 billion in damage. The International Scientology Volunteer Ministers Disaster Response Coordinator has also put out a call for more volunteers and asks that anyone able to do so, contact the Volunteer Ministers website. Known as Pro. Civi. Co. S (Civil Protection Team of the Scientology Community) the Volunteer Ministers hail from Scientology Churches throughout Italy including Rome, Florence, Naples, Padova, Milano and Torino. And many of them are veterans of the deadly 2009 L’Aquila temblor where they contributed more than 18,000 volunteer hours helping the city and region recover. The quake was followed by some 500 aftershocks over the next several days, including a 5.5-magnitude tremor. The August 24 quake leveled the city of Amatrice and left hundreds of cultural heritage sites damaged or destroyed. Flags flew at half-mast as a mass funeral was held for 35 of the victims. Many survivors are now living in tent villages set up by the emergency services. More than 1,200 people have been left homeless. Two full vans of these items left the Church of Scientology Rome the day of the earthquake and were driven to the collection center in a town near the disaster zone. This was not the first time Volunteer Ministers raced to the aid of Italians in need. In spring of 2012, they responded to 6.1-magnitude earthquake that struck the Emilia-Romagna region, and assisted in the city of Midolla building tents, lights, camp beds, and serving food. One VM served as the communicator for the head of civil protection in the town of Bondeno, and another conducted surveys with victims to provide information to authorities, allowing them to invest resources where they were needed most. Come Help at a Volunteer Minister Tent! 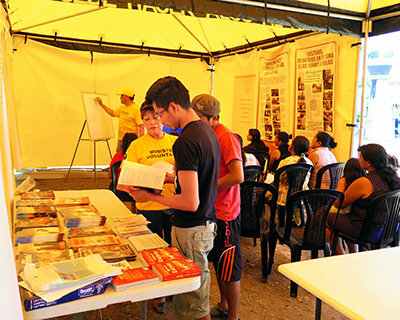 In their yellow tents, Volunteer Ministers deliver seminars and provide life tools to all. In addition to succoring friends and family and helping indiscriminately at major disaster sites, Volunteer Ministers regularly erect bright yellow tents in city centers around the world inviting one and all to find out for themselves that something can be done about it. Individuals tour panels illustrating the VM Handbook’s effective solutions, attend in-tent seminars, get assists for physical ailments or one-on-one counseling for any difficulty. From helping a couple resolve marital strife to teaching a businessman how to set and actually achieve his goals, the VMs manning these tents have an effective solution to hand for virtually any human problem. You are invited to come and volunteer at a tent in your area! Whatever your familiarity with the program, if you have a purpose to help we have a place for you. To find out when, where and how to volunteer, contact us.